I have read a few marriage books in the last couple of years. My goal is to read 2-4 a year. They often challenge me and convict me to put more effort into my own marriage. I just wish I could somehow memorize the words and imprint them on my life permanently. But this book has got to about top all the books I've read lately. And yes, I might say that about everyone, but this one is good and definitely worth reading. Cherish, one simple word, but it really can revolutionize a marriage. Cherish, to put your spouse's needs and desires above your own, to make a conscious effort to seek out the best in your spouse, to affirm them, to be kind, to do things for them. It's showcasing your spouse's strengths while you're willing to step back in the background and let them succeed. Cherishing calls us to go to war against contempt, speaking spitefully to your spouse will kill a relationship. It's noticing and honoring your spouse, seeing them as a real person. One thing I really liked that he said is it's believing your spouse is Adam or Eve, as in, they are the only other person in the world. How easy it is sometimes to compare our spouses worst flaws with our friends' spouse best-in-public-performance. To see our spouse as Adam or Eve is to not even recognize that there are other options. I can't say it as good as he did. Cherishing is studying your spouse, learning what makes them tick, what they like, and how to best serve them. It's looking at them and truly listening, not being distracted by technology. It's taking an interest in their dreams and asking questions. It's a lot of things I have not been doing well, but it's a lot of things my husband has been doing extremely well for me. 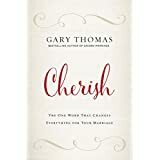 The temptation when reading this book was to think of the few ways my husband responded that didn't feel cherishing instead of analyzing the myriad of ways I responded that showed a lack of cherishing. If scores had been kept, I would have lost. He is good at this cherishing thing and I have a lot of room to improve. I was given this book by Book Look Bloggers. I was not required to write a positive review.